Blue Chips Take the Lead, Enough to Push Stock Market Higher? Investors' sentiment continued to improve on Wednesday, as the broad stock market accelerated its short-term uptrend following Monday's breakout above three-week-long consolidation. The S&P 500 index gets closer to march local high. Will the uptrend continue? There are still two possible medium-term scenarios, but bulls are much happier now. The U.S. stock market indexes gained between 0.7% and 1.4% on Wednesday, extending their short-term uptrend, as investors' sentiment continued to improve and blue-chip stocks regained their strength. The S&P 500 index broke above 2,750 mark and it currently trades just 3.5% below January's 26th record high of 2,872.87. The Dow Jones Industrial Average gained 1.4%, as it was relatively stronger than the broad stock market yesterday, and the technology Nasdaq Composite gained 0.7%. The nearest important level of resistance of the S&P 500 index is now at around 2,780-2,800, marked by mid-March local high. The next resistance level is at 2,830-2,840, marked by the late January short-term consolidation. On the other hand, support level is at 2,750, marked by recent level of resistance. The support level is also at 2,735-2,740, marked by Monday's daily gap-up of 2,736.93-2,740.54. Mixed Expectations, Correction or Just Pause? The index futures contract trade between 0.0% and +0.2% vs. their yesterday's closing prices, so expectations before the opening of today's trading session are virtually flat to slightly positive. The main European stock market indexes have been mixed so far. Investors will wait for the Initial Claims number release at 8:30 a.m. The broad stock market will likely fluctuate following yesterday's advance. Will we see a downward correction at some point? 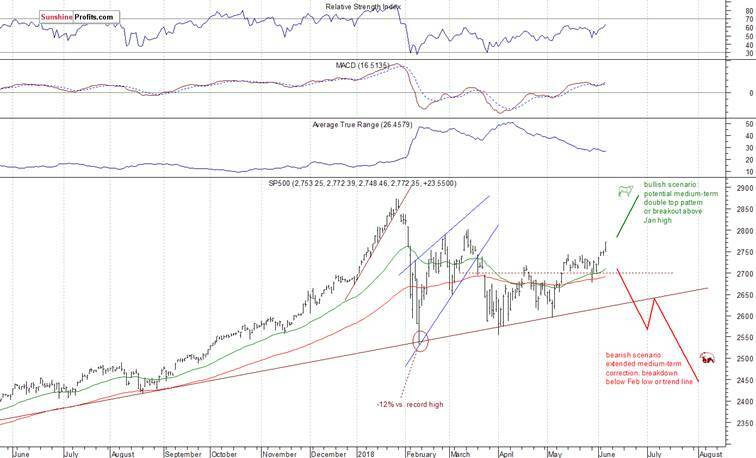 The index may retrace some of its yesterday's breakout above resistance level of 2,750, but there have been no confirmed negative signals so far. The S&P 500 index continued its short-term uptrend yesterday, as it broke above the resistance level of 2,750. Expectations before the opening of today's trading session are virtually flat and we may see profit taking action at some point. But there have been no confirmed negative signals so far. Concluding, the S&P 500 index will likely open virtually flat today. The market may fluctuate after Wednesday's rally. Will the uptrend reverse? Probably not. However, we may some downward correction. Tech stocks may be relatively weaker on Thursday, as investors rotate into blue-chip stocks.